Today was an extremely hot day here. The temperature hit 104 degrees in Atlanta. This evening hubby picked up Chinese from our local restaurant on his way home so we could take a break at the end of the week and try to keep the house as cool as possible. I am just praying our a/c keeps working. 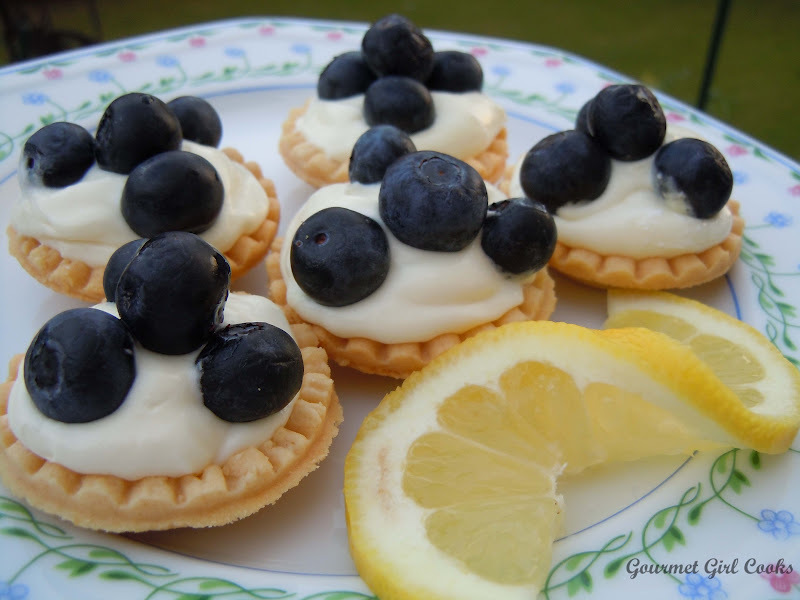 For a refreshing quick and easy little dessert, I decided to make some dainty little "lemon chiffon" tartlets topped with fresh blueberries. I think lemon goes with blueberries just like peas go with carrots! :-) I picked up a package of tiny little shortbread tartlet shells from our local Kroger. They come 16 to a box and are 1.75" in diameter. I also picked up an 8-oz container of "Lite" Cool Whip and a 23-oz jar of California Lemon Fruit Filling. Both the tartlet shells and the lemon filling are Kroger's Private Selection brand. The lemon filling is very tart and sweet all at the same time. Since I was looking for something light and not too sweet, I mixed a ratio of 1 part lemon filling and folded in 3 parts Cool Whip. I dolloped it into the tiny tartlet shells and topped with a few fresh blueberries...and Voila...in less than 5 minutes we had beautiful light little "chiffon-like" lemon tarts....and it did not heat up the kitchen at all. You don't have to slave in a hot kitchen or spend hours and hours to make a delicious dessert. They were a perfect little summertime dessert to end this unseasonably hot evening with. I snapped a pic below for you to see. Enjoy!